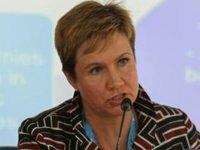 The land reform will have a comprehensive impact on the Ukrainian economy and will bring tangible economic growth of up to $1.5 billion annually, World Bank Director for Ukraine, Belarus and Moldova Satu Kahkonen has said. During the presentation of a new five-year technical assistance program of the World Bank and the EU regarding support for transparent land management in Ukraine in Kyiv on Wednesday, May 16, she said that if the moratorium is canceled, there will be a tangible growth of the Ukrainian economy - $0.7-1.5 billion annually, which is equivalent to annual additional GDP growth of 0.6-1.6%. According to her, the main reasons why the World Bank considers land reform among the key issues on the agenda of Ukraine's economic reform are budget losses due to irrational management of state agricultural land, including corruption, losses of the owners of land plots due to a rent lowered as a result of the moratorium, and slowdown of GDP growth. The country's budget lost $60 million over the past year only from the understated price for leasing state land, she added. At the same time, program manager Denys Nizalov said that this figure applies only to state land registered in the land cadaster, which had an area of only 25% as of early 2018. "What happens to the remaining 75% of state agricultural land, or more than 7.5 million hectares, is unknown," he said. As reported, according to the WB, the rental value of private land plots in Ukraine is below the real value by five times due to the effect of the moratorium. Owners of land plots annually receive $3 billion less in lease payments.